home shop by department dvds enter the kettlebell! By Greg T. Sheriff's Dept. — California U.S. of A. Once the prized and jealously-guarded training secret of elite, (Russian athletes, old-school strongmen and the military) the kettlebell, has invaded the West. Pavel lays out a foolproof master system that guarantees you success—if you simply follow the commands! With Enter the Kettlebell! Pavel delivers a significant upgrade to his original landmark work. Drawing on five years of developing and leading the world's first and premiere kettlebell instructor certification program, and after spending five years of additional research into what really works for dramatic results with the kettlebell—we have Enter the Kettlebell! How sure are we that Enter the Kettlebell! (DVD) will work for you? Simply fill out the form below and put Enter the Kettlebell! (DVD) to work for you right now. Obviously, we would go out of business if Enter the Kettlebell! (DVD) didn't work, the way we said, right? With the promise of a full refund if you're unsatisfied, you have nothing to lose by trying Enter the Kettlebell! (DVD). Go ahead and try it today. The kettlebell. AK-47 of physical training hardware. Hunk of iron on a handle. Simple, sinister, brutal—and ferociously effective for developing explosive strength, dramatic power and never-say-die conditioning. 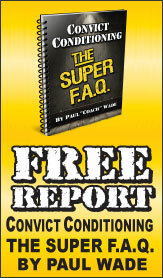 The man's man's choice for the toughest, most demanding, highest-yield exercise tool on the planet. Guaranteed to forge a rugged, resilient, densely-muscled frame—built to withstand the hardest beating and dish it right back out, 24/7. Once the prized and jealously-guarded training secret of elite Russian athletes, old-school strongmen and the military, the kettlebell has invaded the West. And taken no prisoners—thanks to former Soviet Special Forces physical training instructor and strength author, Pavel Tsatsouline's 2001 publication of The Russian Kettlebell Challenge and his manufacture of the first traditional Russian kettlebell in modern America. 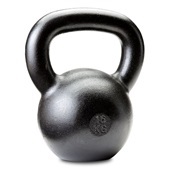 American hardmen of all stripes were quick to recognize what their Russian counterparts had long known—nothing, nothing beats the kettlebell, when you're looking for a single tool to dramatically impact your strength and conditioning. A storm of success has swept the American Strength and Conditioning landscape, as kettlebell "Comrades" have busted through to new PRs, broken records, thrashed their opponents and elevated their game to new heights of excellence. With Enter the Kettlebell! Pavel delivers a significant upgrade to his original landmark work, The Russian Kettlebell Challenge. Drawing on five years of developing and leading the world's first and premiere kettlebell instructor certification program, and after spending five years of additional research into what really works for dramatic results with the kettlebell—we have Enter the Kettlebell! With just two kettlebell exercises, takes you from raw newbie to solid contender—well-conditioned, flexible, resilient and muscular in all the right places. Jumps you to the next level of physical excellence with Pavel's proven RKC formula for exceptional strength and conditioning. Propels you to a Special Forces level of conditioning and earns you the right to call yourself a man. When you rise to the challenge—and Enter the Kettlebell!—there will be no more confusion, no more uncertainty and no more excuses—only raw power, never-quit conditioning and earned respect. Yes! I am ready to take my strength and conditioning to undreamt-of new heights with Pavel's 100% guaranteed, foolproof, proven Masterplan for fast-track kettlebell training success. 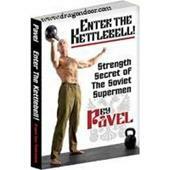 I want to order Pavel's Enter the Kettlebell! DVD NOW—and not waste one more day, being weaker than I need to be. "Pavel's Enter the Kettlebell! 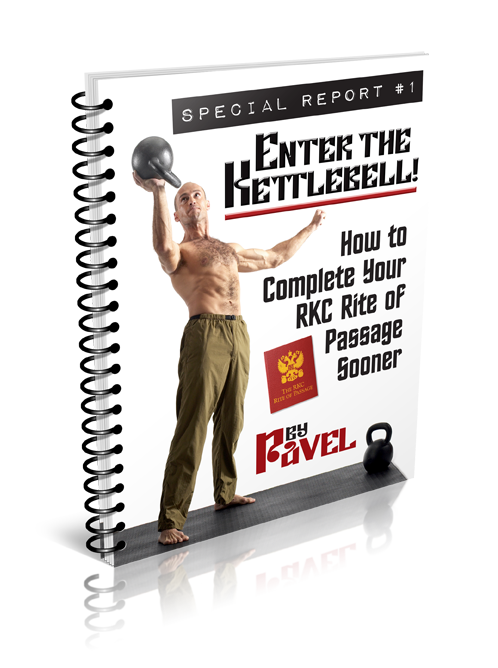 helps you weed out weakness… develop explosive power, strength and never-quit endurance—with his PROVEN system for rapid, spectacular and across-the-board gains in physical performance"
The kettlebell has proved its worth many times over since Pavel has introduced it to America. Elite athletes, fighters, special operators, and regular hard Comrades swear by the extraordinary strength and conditioning delivered by this ancient Russian tool. Now, it is YOUR turn to Enter the Kettlebell! For a kettlebell novice, the hardest part is knowing where to begin. And what you really need to do to get off to a quick—yet rock-solid—start. For the Comrade who's already put in a year or two of kettlebell time, it's easy to hit a plateau after explosive early gains. Pavel knocks him out of his sophomore slump and helps him take his game to a higher level. Then there's the grizzled KB vet who's been around the block and got too arrogant to practice his fundamentals (or never learned them in the first place). Pavel hammers the fundamentals because "it is the mastery of the basics that separates the elite from the rest." With Enter the Kettlebell! Pavel has done all the work for you—honing a masterplan of essential training secrets that guarantee to make you powerful, resilient, and enduring—if you simply follow the proven guidelines. "If I could've met Pavel in the early 80's, I might have won two Gold medals." "As a school teacher the RKC certification was the best thing that I could do for my students. I highly recommend the RKC certification course to personal trainers, teachers and Olympic weightlifting coaches in their development of athletes with whom they work." "I have both ACSM and NSCA certifications. Pavel's RKC was light years beyond these. Much more practical and useful information." "Pavel's Russian Kettlebell Certification was an intense learning period for exercise practice that you can't get anywhere else with people you probably couldn't find together in one group if you searched a lifetime. Excellent and thorough knowledge by all instructors, especially Pavel. Scope is probably the broadest I have ever dealt with. Practical use is excellent." "A really complete and well structured course: Top quality of information." "Since I am a gym owner, I have been to a lot of different workshops: this one is by far the best. The quality of instruction and level of attention is second to none. This is the highest quality of instruction I have ever had, and I have been to some excellent workshops. 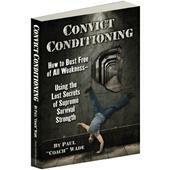 There is tremendous depth and it is extremely practical for anyone in athletics or just looking to get in shape. This workshop accomplished everything and more that I was hoping for." "It was the most intense hands on high volume information and practical workshop I have ever attended. And believe me, I have been in this field for 27 years. And have been to countless seminars and workshops and nothing compares to what you will learn. If you you're an expert in this field, think again! I've got as much education and background as some of the best and I started learning the moment I walked through the door." "Excellent course, with great instruction and I highly recommend it to anyone who is serious about gaining a strong & powerful body. Best complete course I've ever taken w/ really useful knowledge and materials." "Best course I have even been to! The one big difference is truth. RKC teaches and lives by the truth. No big words and making stuff up to sound important. Material is excellent, never had so much." "The knowledge of the exercises taught was bar none. Quality = Great. Scope of material = exactly what we needed for knowledge to teach. Loved it!" "The most intense and complete instruction training course I have ever experienced. A level of detail of instruction I have not found anywhere else. Pavel's depth of knowledge on all aspects of training is amazing. Nothing else is even close." By Greg T. Sheriff's Dept. / California U.S. of A. As Law Enforcement, I can tell you that if you are not in shape for a fight or have the toughness (physically and mentally) to keep fighting after being stabbed or shot by a suspect, one day you are going to die. I have been working with my kettlebells for a week now following along with the DVD and getting an awesome workout everytime. Pavel's directions are easy to follow and very detailed. HIS ATTENTION TO DETAIL WILL SAVE YOU FROM INJURY...........IF YOU LISTEN ! ! ! ! These are awesome full body workouts that will put you in fighting trim building BOTH strength and endurance. Thanks to you Pavel and the people at Dragon Door for bringing a fantastic OLD SCHOOL tool back to the forefront of REAL fitness here in the U.S. In one word, outstanding. The elementary kettlebell routines with a single kettlebell. I lost 20 pounds in a single month just with this basic set of exercises. Best DVD I have ever purchased. By Anonymous / Schererville, In. I was impressed with this DVD. I felt is was much more instructive and outlined than The Russian Kettlebell Challenge and got me back into lifting kettlebells once again after a 2 year layoff. Rated 10/10 Perfect Companion to Enter the Kettlebell Book! I purchased the Enter the Kettlebell book and DVD combination and I'm really glad to have both resources! Being able to see Pavel performing the different kettlebell moves is invaluable and reinforces the more detailed information presented in the book. I'm using both the book and the DVD to correct mistakes in my form and I'm looking forward to purchasing other Dragon Door kettlebell books and DVDs in the future to advance my training. Even after easing into the routines, I woke up one morning in extreme pain. It has taken three weeks to feel 80% normal. Keep in mind that I have been working out steady for six months prior to this without incident. I would not recommend this workout. I appreciate the straight forward approach and lack of non essential b.s. Mr. Tsatsouline uses.Great product..Excellent service.. I learned from Pavel's concise and explicit instruction to use a kettlebell safely. Now that I have used the kettlebell safely, I have been able to increase my strength, flexibility and abiity to perform in ways that relular weight trining, running (marathons) or other diciplines could not get me results I needed. I also needed to produce an environment to 'heal' from 49 years of life. I had a shoulder injury and persistent lower back pain which led to a severe bout of 'plantar fasciitis' last year. I was off for months and getting fat and dumpy not to mention old, I was 49 at the time. In comes Pavel & Dragondoor. Long story short, "Enter The Kettlebell" has allowed me to produce and environment where everything is better at 50 years of age than it has been for many years. By the end of 2008 I will 'practicing' with a 71 lbs. kettlebell, to those who have ears, you know what that means. In Russian standards I could be becoming a man at the age of 50! That must in some ways mean that I still am young! 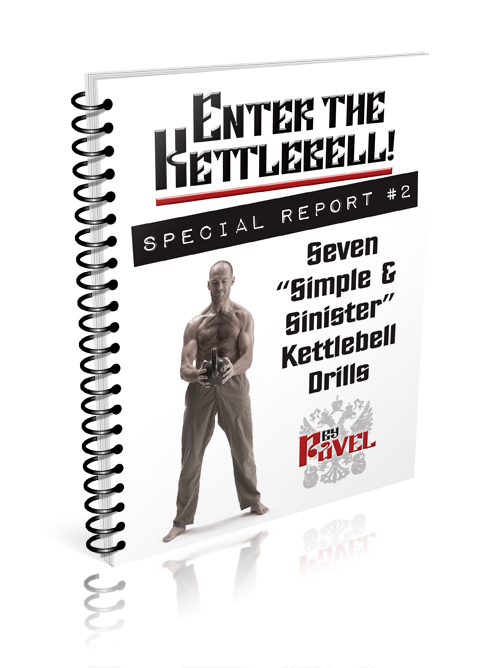 Thanks Pavel for Enter The Kettlebell DVD! It changed my life! I found the instructions in this video to be very technical, direct and Spartan. It helped me to learn the form very quickly, I thought. In fact, working out with a kettlebell works me so thoroughly that I gave away my total gym and the only workout device that I use is the kettlebell. I feel LOADS of pain, but in two months I never once injured myself to where I had to stop. I went from two days a week to six in no time, and now own four kettlebells. Maybe I should get a commission. I've sold the KB so well at work that five guys (including my boss) bought one. I'd recommend the bell and this video to anyone.